Heidi Klum wore one of the most dramatic dresses on the Oscars red carpet and she made a great choice with her after party dress too. The model slipped out of her John Galliano gown, which has now been donated to make money for charity, and into a silver mini dress by Roberto Cavalli as she attended the Annual Elton John AIDS Foundation Academy Awards viewing party. If your interested in winning Heidi's Oscar gown you can enter the Diet Coke sweepstakes, which donate $1 to benefit women's heart health, with the goal of raising $250,000. See mycokerewards.com for more info. The latest W Magazine sees a whole host of the models of the moment dress up in designer outfits and towering heels for it's Pin-Up editorial. Amber Valetta wears an ostrich feather dress by Lanvin and black heels also by the brand. Angela Lindvall is in a pink slip by Blumarine and Dior by John Galliano heels. Kate Moss wears a body suit by Jean Paul Gaultier with Alexander McQueen heels and then silk underwear by Eres with Junko Shimada shoes. And Isabeli Fontana wears a Viktor + Rolf cotton shirt with green underwear by Deborah Marquit and shoes also by Viktor + Rolf. 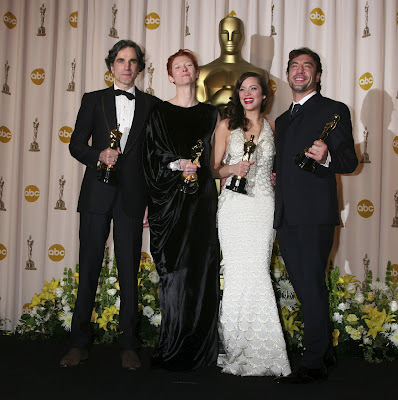 A look at the big winners at the 80th Annual Academy Awards. Best Actor Daniel Day Lewis, who wore a Paul Smith suit, now has two Oscars, after his other Best Actor award for My Left Foot in 1989. Marion Cotillard, who won Best Actress for La Vie En Rose, wore a gorgeous fish scale dress by Jean Paul Gaultier and jewels by Chopard. Tilda Swinton kept it to the bare minimum in her plain black Lanvin dress and thick silver, as she picked up her Best Supporting Actress award for Michael Clayton. And Javier Bardem, who won Best Supporting Actor, wore a suit by Prada. Renee stuck with her favourite designer, Carolina Herrera, opting for this beautiful silver strapless gown by the designer. Nicole Kidman and Keith Urban at the Oscars. Expectant Nicole wore a simple black gown by Balenciaga and let her necklace get all the attention. The stunning item of jewelry by L'Wren Scott had 1,399 carats of diamonds at was just as beautiful from the back as it was from the front. Mom-to-be Jessica Alba was glowing in her Grecian style Marchesa gown with feather bust detail, plaited up-do and golden Cartier jewelry. Cameron showed off her gorgeous golden tan in a strapless pale pink gown by Dior. She accessorized with a few gems by Bulgari and a clutch by Roger Vivier. Dita von Teese at the J Moore & A Diamond is Forever Private Dinner Party. Dita dressed up in an ethereal looking white dress by Rodarte. 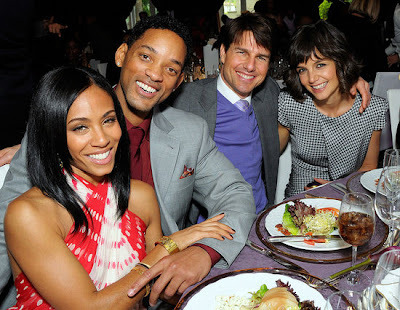 Tom Cruise and Katie Holmes at the First Annual Essence Black Women In Hollywood Luncheon, which was honoring their good friend Jada Pinkett Smith. Katie was very elegant in an Alexander McQueen dress paired with some purple Christian Louboutin sling-backs, which Tom matched his sweater and tie to. And also going down the color cooridinated route Will Smith matched his sweater and tie to wife Jada's polka dot dress. A look at the sports stars and celebrities who attended the Laureus Sports Awards 2008. Model Natalia Vodianova, dressed in a black Valentino gown, who was there with her husband Justin Portman, presented Roger Federer with his fourth Laureus award. Former rhythmic gymnast Alina Kabayeva, who is now a member of the Duma, showed off her glamorous gown on the red carpet. Other sports stars who showed up were Svetlana Khorkina, Yelena Isinbayeva (who wore a Cavalli gown), Lewis Hamilton, Boris Becker, and ex-gymnast Aleksei Nemov, who won 12 medals over three Olympics and was named as a new member of the Laureus World Sports Academy. Russian president Vladimir Putin also attended. Natalie Portman and Scarlett Johansson at the Berlin premiere of The Other Boleyn Girl. The two actresses both looked stunning in their own styles. Natalie wore a blue Rodarte gown, with revealing front detail. And Scarlett showed off her curves in a 50s style full skirted dress by Oscar de la Renta, teamed with Miu Miu pumps. Paris Hilton at the 2008 MAGIC Convention - Day Two, in Las Vegas. Paris looked bright and fresh in a blue jacket, top and jeans combo, with Dior sunglasses, heels from her own range and Tarina Tarantino necklace and bracelet. A few pictures from the Valentine's Day Love Ball Gala in Moscow, Russia. Those in attendace of the fundraising event included models Eva Herzigova and Natalia Vodianova, actress Lucy Liu and designers Diane Von Furstenberg and Valentino. Natalia was the real belle of the ball, wearing an appropriatley colored red dress by Diane Von Furstenberg, teamed with a heart shaped clutch. Rachel Bilson pictured at the FOX Studios in NYC. Rachel wore an outfit of 7 For All Mankind jeans and black jacket, teamed with luxe Christian Louboutin studded boots, Ray-Ban sunglasses and a Chanel handbag. Click here to buy Rachel's jeans on-line from the official website. Mischa Barton snapped out having lunch at The Ivy in Beverly Hills.